Home > Ask Our Experts > Do Estate Beneficiaries Have Jurisdiction Over Copyrights? My late father's will bequeathed his entire estate to his four children. He was a writer and would have had a number of copyrights in his name. We have always presumed that, as beneficiaries, the rights would have gone to the estate (i.e. us) and that we would have jurisdiction over the copyright. Is this assumption correct as we now have issues with people who were close to my father (but not beneficiaries)using the copyright as theirs. Copyright is a form of property. Just like any other kind of property, it can be sold, given away or inherited. As such, the likelihood is that you are right in assuming that the copyright in question has been passed on to you as beneficiaries of your estate. There are, however, a significant number of qualifying factors to be considered here. Primarily, as a form of property your father obviously had the right to sell or otherwise divest himself of his copyright during his life. This is a common occurrence amongst published authors; a writer would frequently be expected to give up their copyright in exchange for payment – that is how many make their living. In this case the copyright would not be your property. Similarly, it should be remembered that your father was highly unlikely to own the copyright in any commissioned work. Many writers work almost exclusively on commission, meaning that they are paid for a specific job – rather than having a manuscript bought after completion. 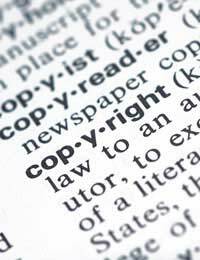 Copyright in works produced on commission, or during the course of employment, will be the property of the employer or whoever commissioned the work. You should also bear in mind that there may be instances of joint copyright; for example where your father co-wrote something with another individual, or where arrangements existed whereby copyright would be shared between your father and another party. This is not uncommon, particularly in cases where the writer cannot secure sufficient payment for a manuscript and therefore insists on retaining a joint interest in the copyright. In any case, unless the other individuals you mention have had some arrangement with your father, whereby copyright has been passed to them, it is unlikely that they have the authority to exploit it. However, you should remember that they may have purchased or otherwise acquired the copyright from another owner, if your father was not the copyright owner when he died. If you are still confident that your copyright is being infringed, you might consider taking action against those who are currently exploiting that copyright. Further information on the action you can take is available elsewhere on this website, or through the Intellectual Property Office.